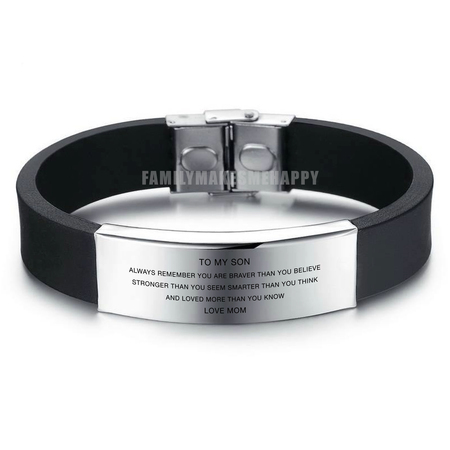 "I am 3000 miles away from my 21-year-old son whom I bought this bracelet for as a Christmas gift...when he received it he immediately video called me and the first thing he said was " Mom...I love it! It is a perfect gift! Thank you!" I want to add...the inscription is absolutely perfect! It says how I would have worded to my son. The gift arrived quickly....my son and I are very pleased. Thank you!" "This bracelet was EVERYTHING!!!! This gift was given to my son on his 16th birthday, and he absolutely loved it! The quality of the bracelet was very sturdy and wasn't cheaply made. It is a keepsake that I believe my son will wear with pride, and all of his friends thought it was a great gift and wish that their parents were as thoughtful. Also, the item was delivered on time. This bracelet is truly all that it represents you will not be disappointed!" "My Son's birthday was today and he LOVED it!! Thank you so much. Everything I have ordered from your company has been excellent and on time! :)"
heavy duty band but writing is way too small. Can hardly read the words. Does not look like the picture for sure! My son loved his bracelet. It's the second one that I got him. His first one got damaged. My son is in the military and he loved it. Although, the Letters could have been larger. It was hard to read.